However much both IKEA and Motorola are doing in their corporate social responsibility efforts in Schaumburg, much more progress can be made in improving their sustainable business practices, reducing carbon emissions and energy consumption, and practicing environmentally sound land stewardship. This could be said of the vast majority of companies, governments, and organizations — including educational institutions. As large companies, they remain major polluters in the area through carbon dioxide emissions by the buildings themselves as well as by the many cars which their customers and employees drive in order to shop or work in their facilities. Reducing energy consumption and carbon emissions remains a major challenge for these and other corporations. 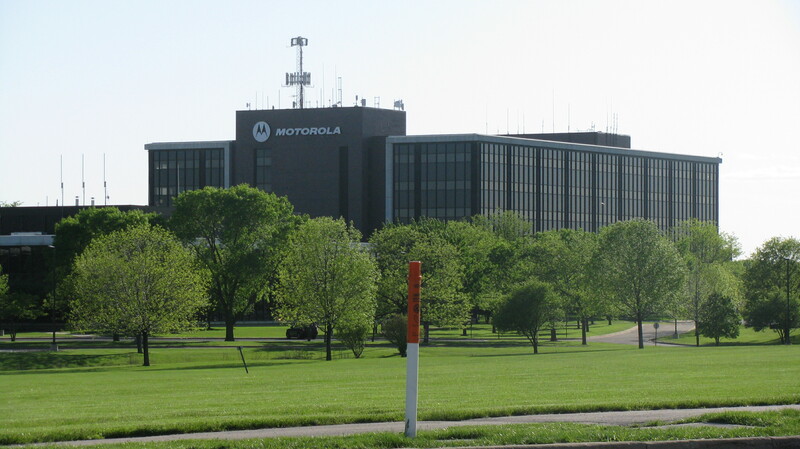 This is the site of Motorola’s International Headquarters, and contains corporate offices, a training center, a museum, a daycare, and extensive parking lots. Much of the landscaping consists of mown turf grass, traditionally landscaped beds, tree and shrub plantings, and conventional detention ponds. A remarkable feature of the site is the large emergent wetland surrounding the naturalized detention pond in the northwest corner of the property. Motorola is actively managing this site for wildlife habitat. A young disturbed woods in the southwest corner of the property also has good restoration potential. Native landscaping could be used throughout the property to link the natural areas to more public spaces. . . .
Several things stand out here. Motorola’s efforts in active land management are laudable, and the ecological diversity of the site as well as its vast area means that there is tremendous potential for restoring native plant communities and providing beautiful natural habitat for wildlife. However, much of the landscape remains conventional in design — and turf grass, especially when combined with extensive hardscape (parking lots, buildings, etc.) mean that water retention on the site could be much improved. If the recommendations of the Biodiversity Recovery Plan detailed here are implemented, Motorola’s campus could become one of the most significant and ecologically valuable green spaces in the Village and serve as an excellent educational resource for the business community as well as private citizens. IKEA, while not occupying nearly the land area that Motorola does, also has an opportunity to rethink its physical footprint on the land and design its parking lots and green spaces with environmental sustainability in mind — particularly the reduction of surface water run-off into the sewer system and the implementation of native plant communities in its landscaping. IKEA’s adjacency to Roosevelt University along McConnor Parkway suggests possible collaborations in creating more sustainably-designed green space in the heavily-developed northeastern part of the Village. More broadly, IKEA’s forestry and wood program is appealing and shows that companies are giving back to society in various ways to create a more sustainable future. Tree planting, forest replanting, and wood sourcing are environmentally friendly efforts and CSR in one important way that such programs come about.